In the 1960s, the hopes for a blossoming progressive Catholicism awakened by the Second Vatican Council were cut short by conservative opposition and the rightward agendas of the previous and current pope. Forty years later, Catholic ­ ≠ the Vatican heralds the revival of a newly democratic and participatory church that transcends narrow Vatican doctrine. 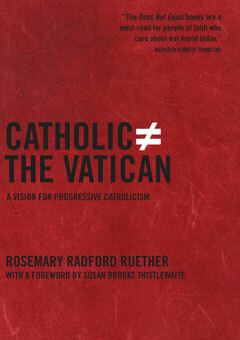 Destined to be a seminal text of progressive Catholicism, this beautifully written and uncompromising book by renowned scholar and activist Rosemary Radford Ruether examines the serious moral contradictions in Vatican Catholicism and offers a vision of a faith committed to justice and peace. Ruether calls for the dismantling of sexist teachings and ascetic values, while promoting healthy sexual ethics and egalitarian communities that welcome women, gays, and lesbians into full equality in the church and even ordination. Reverend Doctor Susan Thistlethwaite’s introduction explains Ruether’s pioneering leadership in progressive Christianity and her unwavering commitment to ecological responsibility and human rights. Grounded in her civil rights work in the Mississippi Delta and the Latin American tradition of liberation theology, Ruether’s long overdue vision of the church as it should be will serve as an inspiration for Catholics everywhere.